This BioProvince (as defined by Armen Takhtajan) comprises Borneo (Kalimantan) and its adjacent islands including the Bunguran (Natuna) Islands, Calamian Islands, Jolo Island, Laut Island, Palawan Island, Pangutaran Islands and the Tawitawi Islands. They are mainly composed of volcanic, sedimentary and limestone rocks, and on Borneo there are a few small areas of ultrabasic rocks. Straddling the equator, the BioProvince enjoys a moist tropical climate with constant high temperatures and more or less constant rainfall. As the meeting place of plants from Australia, China, the Himalayas, New Zealand and the Indo-Malayan realm, and as a major centre for endemism in its own right, the Bornean BioProvince is one of World’s megabiodiversity hotspots with possibly 15,000 flowering plants and 1000 fern species. About 34% of all plants are endemic and there are some 59 endemic genera including Aetoxylon, Amyxa (Thymelaeaceae), Didesmandra (Dilleniaceae), Endertia (Caesalpiniaceae), Geomitra (Burmanniaceae), Lampas (Loranthaceae), Paraselliguea, Polypodiopteris (Polypodiaceae), Schuurmansiella (Ochnaceae), Scyphostegia (Scyphostegiaceae) and Upuna (Dipterocarpaceae). Of the 3000 species of trees, 267 are diperocarps and of these 58% are endemic. It is also a major diversity centre for orchids with in excess of 2000 species. 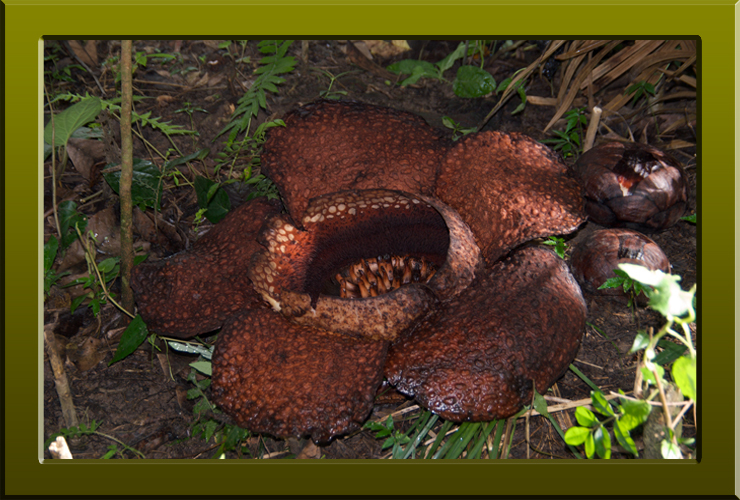 Also of considerable interest here is World’s largest flower (Rafflesia arnoldii), the World’s largest moss (Dawsonia superba) and the World’s largest carnivorous plant (Nepenthes rajah). The latter is the World’s largest pitcher plant and capable of consuming lizards and even rodents. Rafflesia keithii (Rafflesiaceae) a parasitic plant endemic to Borneo with flowers up to a metre in diameter (Copyright © 2010 Peter Martin Rhind).